Isn’t this a creepy coyote parade.. and on our farm and just yards away from our sheep? 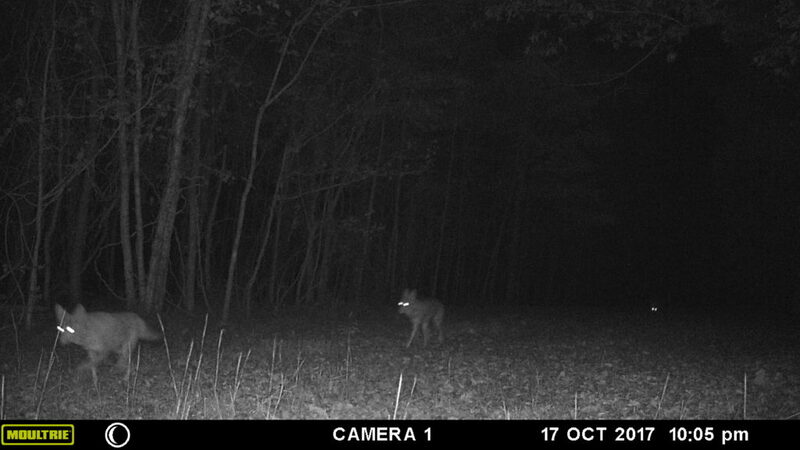 A friend of ours set up his game camera and this is the sight he brought over for us to see on Friday. Of course, we KNOW they are out there because we hear them and we see the way our guardian dogs sometimes go crazy with running the fence and barking during the day and night. But to SEE them in this picture just sends shivers up my spine! Look at this picture below. See the upper right corner where the bracing posts are? Just on the other side of those is the path the coyotes in the above picture took before they entered the woods. They were THAT close to the sheep. And they could easily climb the fence. 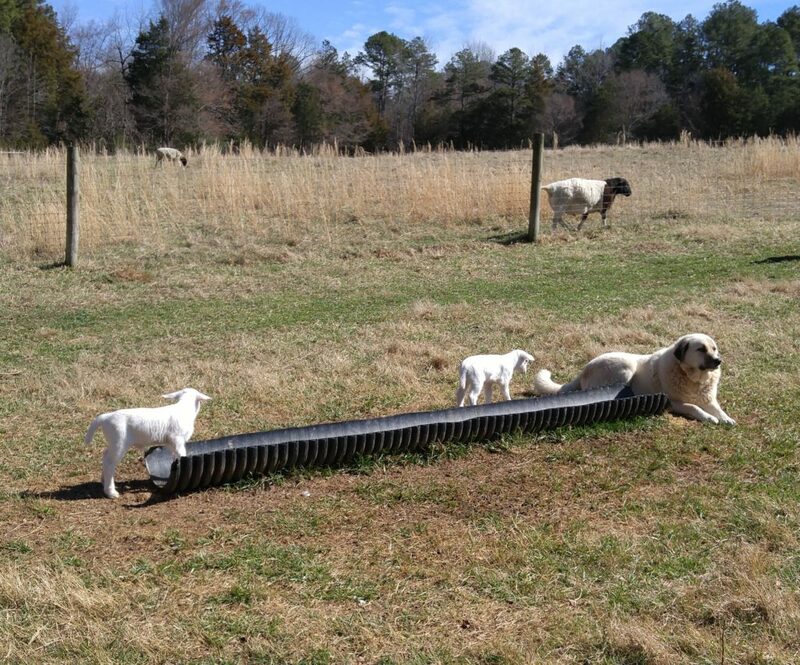 THIS is why we have our livestock guardian dogs. 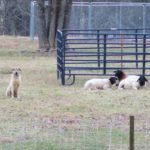 Their barking makes the coyotes think twice about attempting to make a meal out of our sheep. 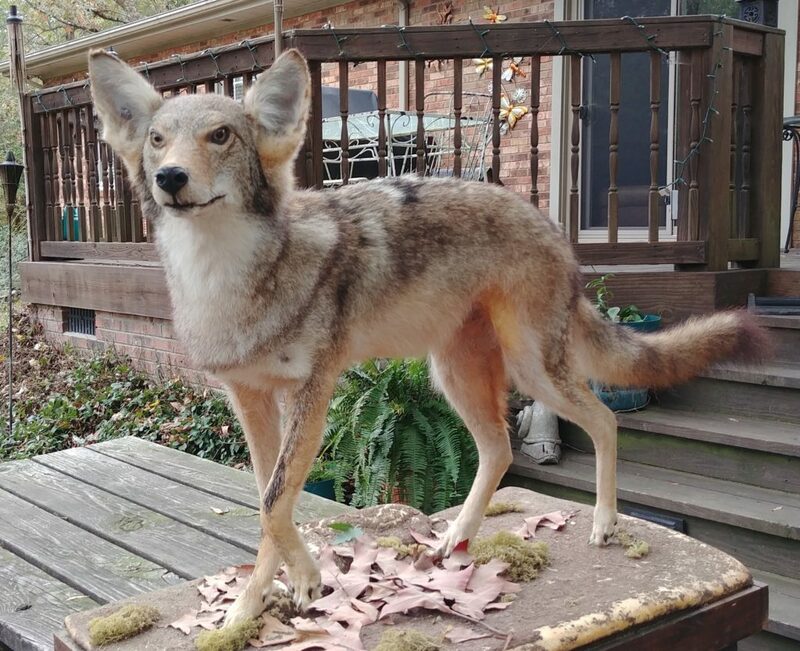 This is our Wile E. Coyote. Can you imagine a REAL one of these glaring through the fence at Hobart and his lambs? Coyotes have a strong self preservation instinct, and it would take a mighty hungry coyote to risk tangling with a big dog like Hobart. Much easier prey are rabbits, rats and mice…and family pets such as small dogs and cats. 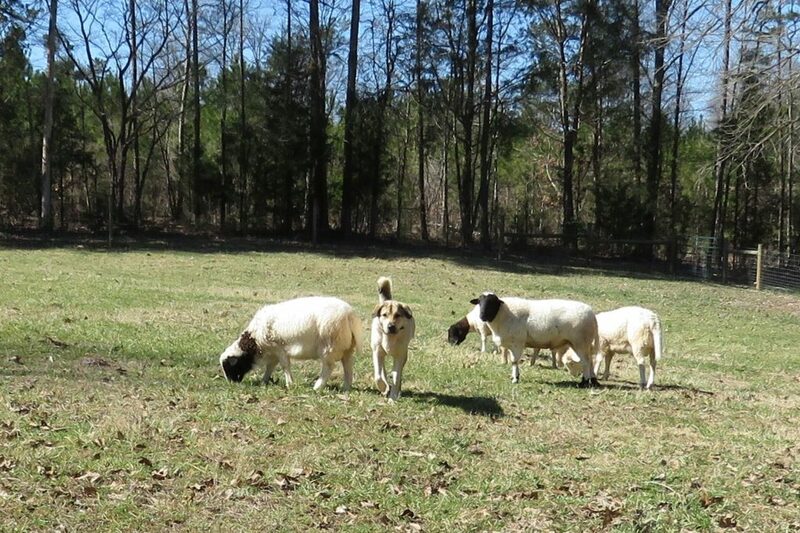 Here’s Turk with his flock of rams. See the woods in the background? They were clear cut a few years ago and they are now full of wildlife of all kinds. New undergrowth is thick and almost impenetrable and a haven for rabbits….and also for coyotes. 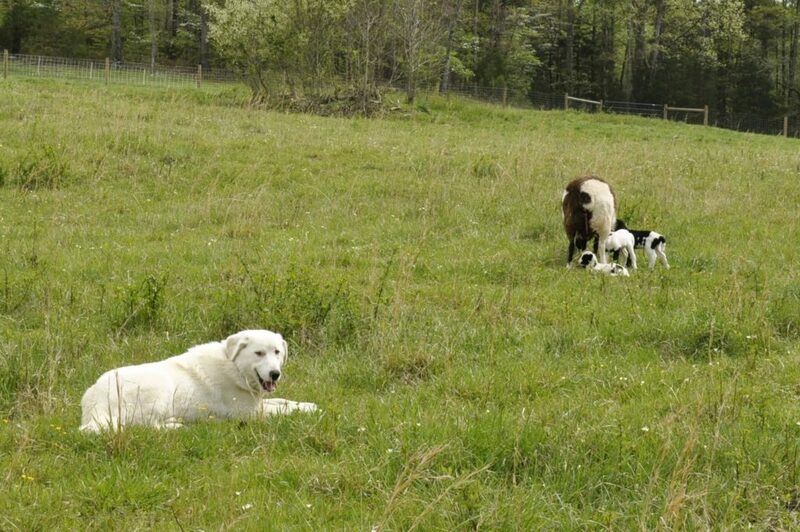 Turk and any of the other guardian dogs that have been in this pasture raise cane all along that fence, and we know that danger lurks in the shadows! Turk Guards his flock from coyotes, too. 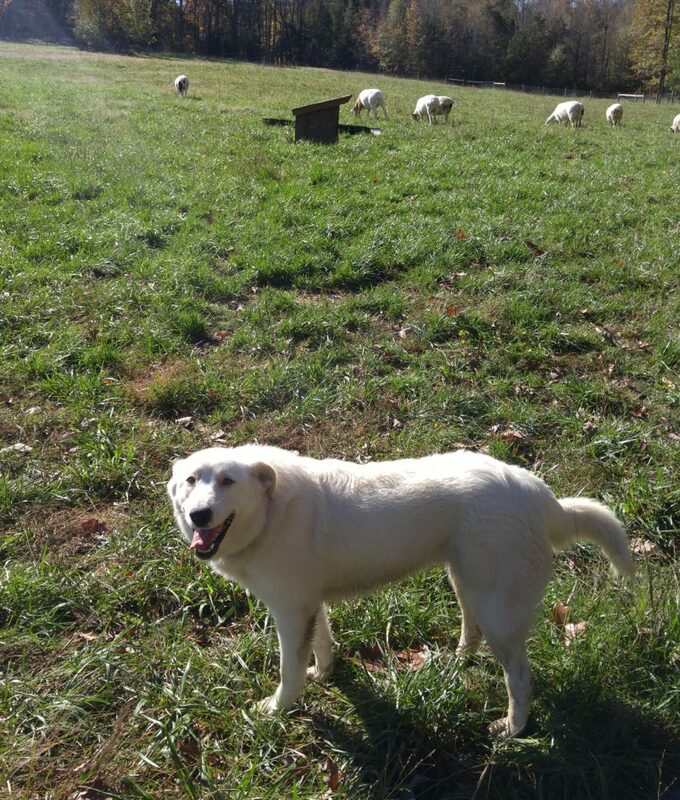 Thelma in the pasture guarding lambs. Cookie all comfy in her bed in the family room. Actually, I don’t blame her. It sure did turn cold today! 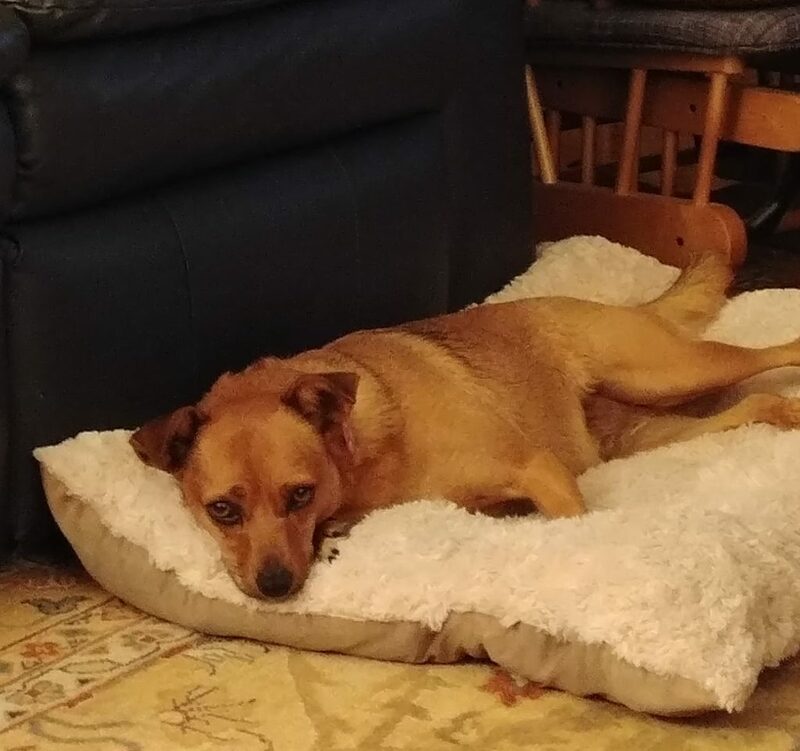 Great weather for woolly sheep and dogs with thick fur coats, but Cookie will spend her nights in our nice, warm house with Farmer Bob and me.